A Home for Everyone. Part 1. Azogues is not in the guide book for Ecuador. A fifty-cent bus ride north of Cuenca, it’s a pretty nice place, judging by my minimal exposure, but I don’t think UNESCO is knocking on the door. The ones who were knocking were K and I, on the door of an orphanage named “Un hogar para todos” which translates to “A home for everyone.” Through the metal bars of the gate we could see a trampoline, a cracked plastic tricycle with purple pedals, and a few mismatched segments of doll bodies. An orphanage is a rough place to be a doll. Our knocks brought a stout woman, hair pulled back in a sensible bun, stains the size of children’s streaking fingers all over the bottom foot of her red-striped shirt. She looked at us with polite caution, standing a few feet back from the gate. K’s aunt and uncle adopted two children from this orphanage years ago, and was our connection to it. We were there to deliver some support, see the changes to the place over the last few years, and visit with good people. Caution gave way to friendliness. As she showed us to our room, there didn’t seem to be anyone else around. Just lots of doll crime scenes. She went back to the kitchen to continue making food, but for whom? 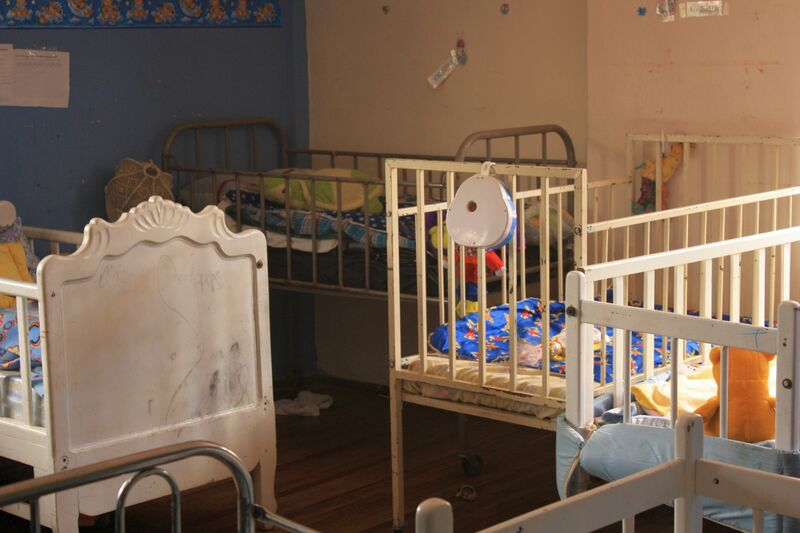 In one sunny room we found two severely developmentally disabled children laying on the mat, gazing up at the windows. They had soft smiles and seemed content, except one’s face would occassionally contort and emit a blood-curdling scream before fading back into vague happiness. K and I looked at each other, both with blank faces, rattled, both hoping the other would somehow make it all understandable. In a small room next to the kitchen we found half a dozen small children, the 5 year olds helping to feed the younger. A row of 4 high chairs against the wall held four tiny boys who peered at K and I with the instinctive interest of the 1 year old, great big brown eyes. We asked to help, and soon I was trying to spoon rice and small pieces of fish into Mateo, a cherub who preferred standing on the seat to sitting in it, and who was unenthusiastic about lunch. He preferred handing me an anonymous plastic piece of a broken toy, then asking for it back, at which point he’d wave it around before throwing it at me. 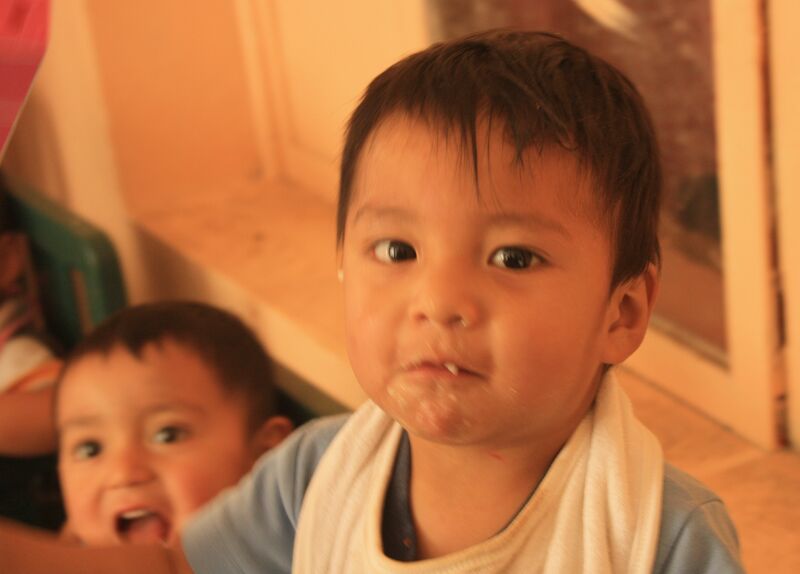 There he is, Mateo, my little rice spouting cherub. I managed to coax two bites in over the course of five minutes, and was feeling pretty good about myself when the blast came, lips blurbling and pieces of soggy rice and fish spraying all over the chair, floor, and me. I am not a parent. This was a new experience for me. I did finally get one and a half mini-spoonfuls in before giving up, and letting one of the 5 year olds carry him off into the playground. I set the metal bowl of uneaten food on the table, not sure what to do next. ← Contrary, concurrent, and compatible. Hello! I just arrived a couple of weeks ago here in Azogues, and I’ll be working with the foundation for the next six months. Good news: all is very well with the organization, and it continues to do amazing work for the community’s most vulnerable children. I was wondering if we could get in touch by email? You can reach me at ann.halsig.hpt(a)gmail.com…loved reading these posts, as well as some of your others…you have quite a gift for writing! ¡Hasta pronto!